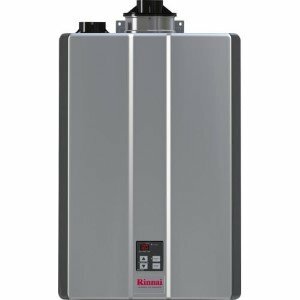 Propane water heaters are, like natural gas water heating systems, very efficient and reliable units, and a great alternative when natural gas is not a viable option. They differ in properties that affect combustion and safety. Propane gas, LP or liquid petroleum is common in urban and suburban residential areas. LP is also known as rural fuel because it is not delivered to homes by gas pipelines like natural gas, but by the truck that delivers and fills up the residential storage tanks, often adjacent to the house. Since the propane gas has relatively high density, you must be very careful in handling the propane. Unlike natural gas that dissipates, propane gas tends to collect and settle at the lowest point of the room where LP water heaters are installed. Gas detectors are recommended. You will notice when buying one of the propane water heaters brands that they are the same as natural gas water heaters and that the conversion kit is usually included, which modifies the gas orifice and gas pressure regulator on the unit. The gas burner is often the same, but propane hot water heaters need more air for LP combustion, so that is what has to be aware. Note: Operating gas pressure for propane water heaters is much higher than for natural gas due to the higher BTU and specific gravity. LP gas water heater burns clean and non-toxic. It is recognized as "green" energy, with low carbon content. Propane is an environmentally friendly fuel, with the reduced greenhouse emission, energy, and money savings. Propane water heaters are energy efficient heating units. They cost one third less to operate than electric heaters but are more expensive than natural gas. Propane water heaters recover hot water twice as quickly as electric. They provide great value as they burn hotter and it takes shorter to pay for itself via energy savings. They are reliable. The individual storage tanks most often serve homes, so the power supply is virtually uninterruptible. The gas is safe, because of the built-in properties and strict regulations. There is a wide selection of sizes, installation, and venting options for heaters. 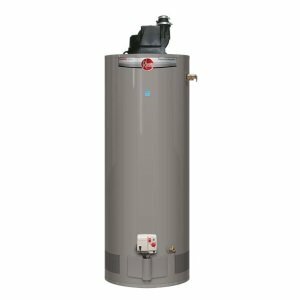 LP water heaters are extremely durable and can last long with the minimum service requirements, while heating elements in electric models usually require replacement several times over its lifetime. Tax credits for propane water heater users. When searching for the propane water heaters, you can, like with the natural gas units, choose between the storage or tank type and on-demand or tankless models. Note: All heaters are rated for combustion efficiency, or how many BTUs are used to heat water. If a standard heater has a combustion efficiency of 80 percent, 80 percent of the available BTUs are being used for heating. The other 20 percent is lost up the flue. Propane hot water tanks are designed with the capacities ranging from 40 gallons to more than 100 gallons. Tank-type propane water heaters work on the same principle as tanks on natural gas, and you can find more info here. Note: 50-gallon LP water heater can provide as much hot water as 66-88-gallon electric unit in 2.5 baths home. When installing these conventional tank-type propane water heaters, you will see in the manual that they are subject to special requirements for venting. Usually, there are two manuals, one is for installation, and the other describes venting requirements. This is one of the reasons why we recommend a licensed plumber/ professional. More about propane here. 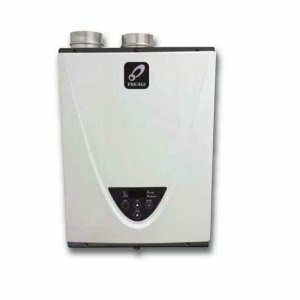 Propane tankless water heaters are also popular as they offer modern and space saving design, they are much more efficient than tank type, using less fuel and decreasing emission and greenhouse gases. The process of how they prepare hot water is similar to natural gas combustion. For more info about tankless heaters, read here. Tip: LP water heaters should not be installed in a basement if such installation is prohibited by federal, state, local laws and codes. 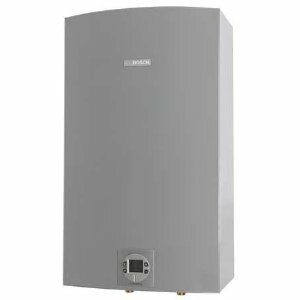 If we compare prices between the tank-type and tankless water heaters that are using LP as a fuel, these instant units are costing up to twice than standard models. However, the saving comes from the operating costs, and on-demand models can pay for themselves in a short time.